I have been offline for several weeks....things have been a bit crappy. I didn't feel like talking to anyone, but as my job requires me to do so, I just avoided the computer as much as possible instead! I did tat though, it is good therapy for shattered nerves, I think. I completed the jewelled square, with Miranda's thread and Fox's beads. There was enough thread left on the shuttles to make the oval rose from Sharon's book. 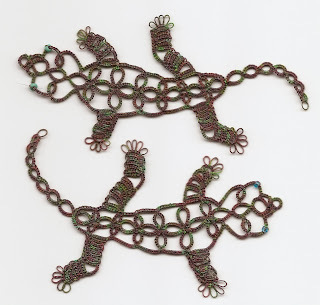 I then decided, inspired by the pretty beads to make a gecko in the brown and green thread. I wound too much onto my shuttles, and so I made two of them! I am always getting the pattern slightly wrong, so even though I now have three they are all different! I have at last finished my lace pillow and actually made a little sample of lace on it. 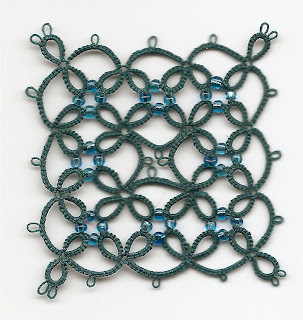 This pattern is very simple, and is made in DMC 80. I love the way cats are always so helpful. This is the edging once it has been removed from the pillow. 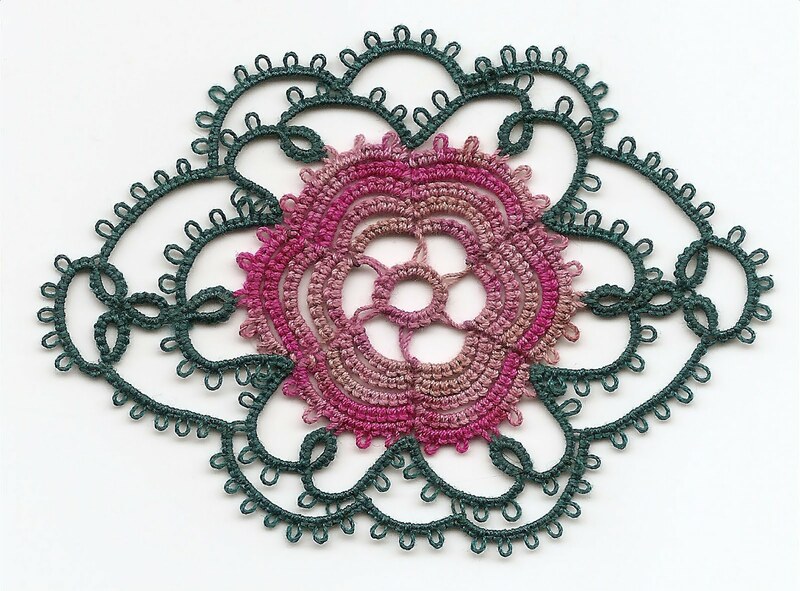 I have also been tatting an edging, Mary Konior's 'Maids of honour', which is a good one to do because one shuttle goes a long, long way. I have done all this and have still a nearly full Shuttleshop shuttle, (which means it's not the biggest one I have.) David's daughter is getting married next year, and a tatted handkerchief seems to be called for, so I will probably use this pattern for that, only in white of course. Mary Konior's pattern 'Maids of Honour', first row. I'm happy to see you blogging again! My, you've been busy. I think it's good that your geckos are each slightly different... it's more natural. Your pillow is beautiful! I'm sure I'd be inspired to work on bobbin lace more often with such a lovely pillow. It's good to see you back again. Always love seeing your work. Nice to see you, Snowy! Your tatting is lovely - all of it. I love the fact that in this way Miranda, Fox and Snowy have made contact, in that first motif, which I love! I often comment on her blog and it was such fun o see her thread and my beads in your beautiful motif. Good to have you back and thank you for being so brave and tackling one of my patterns. Diane, the pillow was fun to make, I see Mark is making a Honiton pillow, and he advocates chopping up the straw...I didn't know that, oops. I might make another one, a bit smaller and do it with chopped straw. Fox, it seemed serendipity that your beads and Miranda's thread should match so well, I was so pleased to receive them! Jane, I love this pattern, no courage needed! Thanks for sharing it. Sometimes Life does get a bit messy - you just have to work through it, and I can see that tatting has helped you! I love that Oval Rose, may I ask the title of the book it's in? Hello Maureen, the book is Marvellous Motifs by Sharon Briggs. 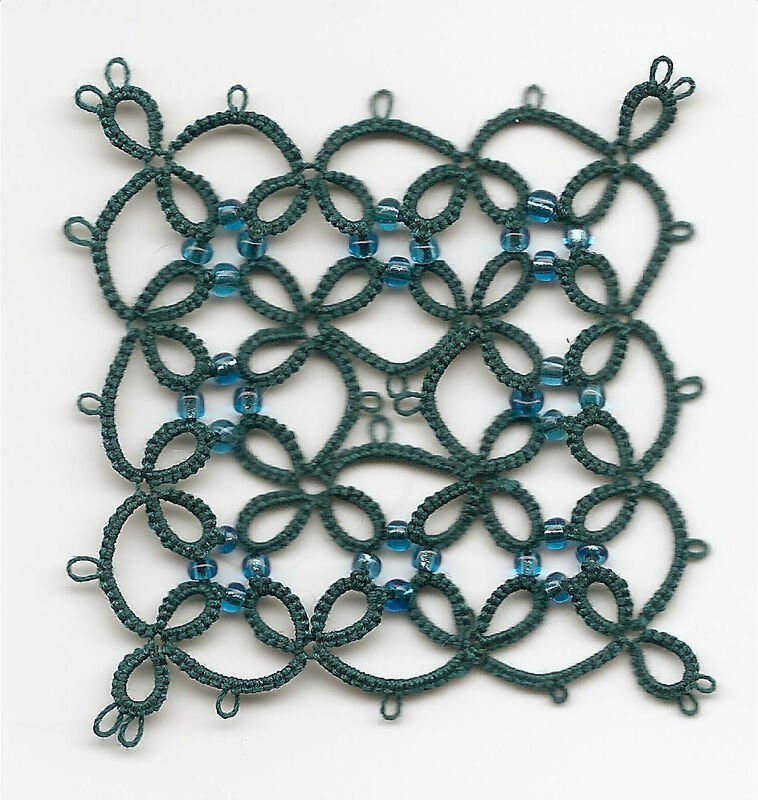 Enjoyed seeing your tatting and bobbin lace, hope you are feeling brighter. missed you.